Shannon Teamer lives up to his name. He helps University of Nebraska at Omaha (UNO) Project Achieve students feel they are part of a team, working towards the same goal: a degree. Teamer is the director of Project Achieve, UNO’s TRIO program. TRIO is a federally funded organization, which originally had three programs to help underrepresented students navigate through upper education: Upward Bound, Talent Search and Student Support Service. It has expanded to include several similar programs, like Project Achieve. Project Achieve serves first-generation students, students from low-income backgrounds and students with disabilities. Teamer makes sure students have the support they need to graduate, such as mentoring and technology access. Teamer has been involved with TRIO programs since the eighth grade. He grew up in a single-parent household. His mother dropped out of UNO when she became pregnant with his older brother. Teamer’s mother enrolled him and his brother in Upward Bound. He remained in the program throughout high school. Teamer, his brother and his mother earned multiple degrees after he and his brother finished high school. Teamer studied psychology at the University of Nebraska-Lincoln, and became involved with the TRIO program there. He was in a living-learning community that helped him feel comfortable on campus. Without TRIO, Teamer said he would have struggled to find his home on campus. After graduation, Teamer worked with other programs that served underrepresented students. 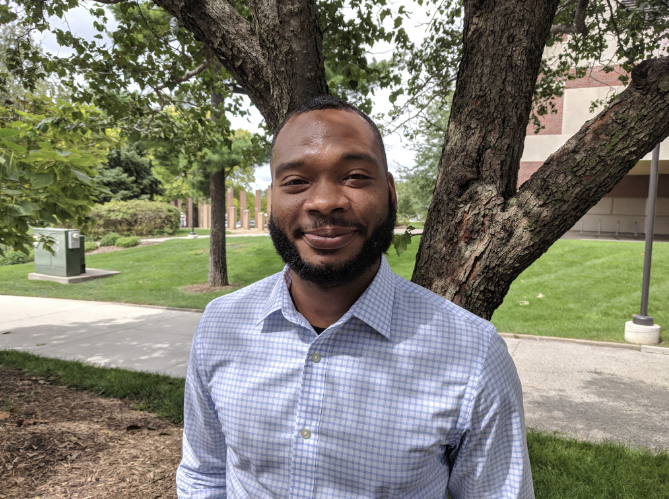 Then, he found his way back to TRIO as a coordinator for Creighton University’s Talent Search program, which works with middle school through high school students. “I was paying it forward through the same programs that helped me,” Teamer said. During his third year at Creighton, he applied to be the director of Student Support Services, and he was offered the position. At the same time, he worked on his master’s degree in business administration. After he finished his master’s, he decided to leave Creighton. He wrote and published a book, Start. Stay with it. Finish Strong: The Most Honest Path from Idea to Achievement. He also began working with the Chamber of Commerce on a project called Career Rocket, which creates connections between professional organizations and educational institutions. He helped provide over 11,000 career experiences to students. Teamer thought he would continue to work on his own projects, but chance brought him to UNO. He ran into a UNO Project Achieve advisor at the mall. He had worked on a TRIO committee with her, so she stopped him to say the director position was open. At first Teamer wasn’t interested, but after thinking about it for a couple of weeks, he changed his mind. “I thought, ‘There has to be a reason that happened,’” Teamer said. He and his wife had left the mall when he realized he forgot one item. They turned the car around, and he ran back inside to grab it. That’s when he ran into the Project Achieve advisor. “If that wouldn’t have happened, honestly, I wouldn’t be here at all,” Teamer said. Connie Sorensen-Birk, a Project Achieve advisor, is grateful Teamer found his way to UNO. Teamer said he enjoys seeing students overcome barriers such as microaggressions, financial burdens and discrimination. “I come from the same background, so it’s almost like we’re walking together,” Teamer said. Sorensen-Birk agrees. She has noticed students look up to Teamer because he overcame similar barriers and walked off campus with two degrees.